Dyspepsia—upset stomach or indigestion—is a condition characterized by a burning or painful feeling in the stomach or upper abdominal region. Although the upset stomach remedies most often prescribed by medical practitioners include over-the-counter or prescription acid-blocking medications, these come with a number of serious side effects like severe tiredness and mental or mood changes. However, dyspepsia doesn’t have to be a problem that requires popping pills or medications. It is not surprising that more and more people are looking for natural ways to soothe upset stomach with home remedies for dyspepsia, such as certain natural foods, herbs, or lifestyle suggestions. Some of them include avoiding particular food triggers; using a heating pad; drinking clean water; or taking remedies like ginger, apple cider vinegar, or baking soda. Read on to learn more about upset stomach symptoms, as well as home remedies for upset stomach. We will also detail what circumstances require you to visit a doctor immediately. Interestingly, dyspepsia is not a disease but a sign of more serious health problem, like a peptic ulcer or a gallbladder disease such as cholecystitis or gallstones. That being said, dyspepsia can usually be traced back to certain drinks or foods, poor eating habits, and poor lifestyle choices. For instance, indigestion can be caused by eating too much at one meal; eating too fast; eating fatty, greasy, or spicy foods; drinking too much alcohol or caffeine; smoking; and stress. What about upset stomach symptoms? Most often, dyspepsia sufferers complain of an uncomfortable fullness in the stomach, as well as a pain in the chest or upper abdomen. Dyspepsia also often arises during or immediately after eating. What are the best home remedies for dyspepsia? Home remedies for upset stomach and diarrhea, and other related symptoms, will focus on treating the underlying cause of dyspepsia. When this is done, symptoms will typically go away within hours. There are a number of natural ways to soothe upset stomach. Home remedies for upset stomach can be as simple as finding time to relax. This may sound easy enough; however, there is a direct connection between dyspepsia and stress. So, when you relieve stress naturally with yoga, exercise, massage, or by spending time in nature, you may find that upset stomach problems begin to disappear. It is also a good idea to avoid possible food triggers of dyspepsia, especially processed foods high in sugar, salt, refined oils, and artificial sweeteners; fried foods and vegetable oils; spicy foods and sometimes acidic foods like citrus fruits, tomatoes, onions, and garlic; and beverages like carbonated, alcoholic, caffeinated, and sugary drinks. It also can be helpful to avoid smoking and drugs such as NSAIDs like aspirin and ibuprofen, birth control pills, steroids, and antibiotics. This is because they can easily throw off digestion and cause upset stomach symptoms. There are also various upset stomach remedies that can help with dyspepsia relief. This section will continue to detail dyspepsia remedies, but will focus on certain food, herb, and lifestyle and diet approaches. Let’s take a deeper look at the different home remedies for upset stomach below. Ginger (Zingiber officinale) is often one of the first upset stomach remedies people turn to for dyspepsia symptoms like bloating, gas, or constipation. It is also a great upset stomach nausea remedy. An interesting 2011 study published in the World Journal of Gastroenterology found that taking three ginger capsules of ginger daily can help with functional dyspepsia—a condition characteristic of abnormal delayed gastric emptying. You can also cook with ginger, or add in one of your favorite green juices. Ginger also makes a great tea that can be consumed two or three times daily when dyspepsia is at its worst. Apple cider vinegar is another key remedy used for upset stomach symptoms, such as belching or nausea. The acetic acid, enzymes, and pectin in apple cider vinegar all support proper digestion, and this may include relieving dyspepsia symptoms. For best results with dyspepsia symptoms, many consume one to two tablespoons of apple cider vinegar in a glass of water, and drink it before eating. Whether you have dyspepsia or not, water consumption is always important for your health. Water is one of the better upset stomach diarrhea remedies. Drinking water is crucial when you’re losing volume in your stool, and this leads to diarrhea. To prevent dyspepsia symptoms like diarrhea, nausea, and bloating, it is a good idea to drink 16 ounces of filtered water every hour. It can also be a good idea to relieve dyspepsia with a heating pad or hot water bottle. Placing it on your upset stomach can increase blood flow to the skin, and transfer the pain from the inside to the outside. The warmth will also distract you from pain or cramping, while the heat can relax the muscles and reduce symptoms like nausea. That being said, it is best to avoid leaving the heating pad on your body for too long since you risk damaging the skin from overuse. Mint, and peppermint in particular, contain menthol that could help enhance digestion and stimulate the flow of bile. Peppermint might help with all sorts of digestive troubles and indigestion symptoms, including bloating, cramping, gas, bloating, and nausea. It can be helpful to drink peppermint tea, chew fresh peppermint, or drink water with fresh mint or a drop of peppermint oil, and consume before eating. Aloe vera juice is another common way to soothe upset stomach symptoms like abdominal pain, constipation, and indigestion. The plant’s contents can neutralize acid, encourage digestive bacteria, and regulate bowel movements. A study published in the Avicenna Journal of Phytomedicine in 2014 found that gastric acid levels were significantly lower in rats with gastrointestinal problems when treated with aloe vera. However, as with other laxatives, aloe vera juice is not recommended when you have diarrhea. Chamomile (Matricaria chamomilla) tea contains antispasmodic and anti-inflammatory properties that may help relax the muscle lining of the intestinal tract, which can soothe upset stomach and reduce pain from spasms and cramping. It can be used for various dyspepsia symptoms like indigestion, gas, diarrhea, nausea, vomiting, and constipation. For treating dyspepsia, take chamomile tea two to three times daily. The most popular probiotic food is live cultured yogurt made from the milk of A2 cows, sheep, or goats. Yogurt is especially helpful for an upset stomach when it comes from grass-fed animals. The best yogurt should also be organic and without added sugar or flavors. Other beneficial probiotic foods for digestive health include kefir, coconut kefir, sauerkraut, natto, miso, and kombucha. Fennel (Foeniculum vulgare Miller) seeds and fennel essential oil are also effective upset stomach remedies for dyspepsia relief. For instance, chewing fennel seeds after a meal is a great approach for improving digestion. Volatile oils in fennel seeds like fenchone, a-pinene, and limonene can help stimulate secretion of gastric and digestive juices. For dyspepsia, consume a half-teaspoon of ground fennel seeds three times daily in water. You can also take fennel tea, or mix a drop of fennel essential oil in water. Fenugreek (Trigonella foenum-graecum) seeds are another great remedy to help soothe upset stomach. They might also help treat constipation, bloating, and stomach inflammation known as gastritis. The water-soluble fiber in fenugreek is known to relieve constipation in particular. Fenugreek is often featured in Indian recipes that also include curry powder and turmeric. Lemon water is an easy and effective digestive remedy for relieving dyspepsia, or an upset stomach. Since lemon juice’s atomic structure is similar to the digestive juices found in the stomach, the lemon juice will trick the liver into producing bile. This will keep food moving through the gastrointestinal tract. To help with dyspepsia, simply squeeze juice from a lemon into a glass of water. Sip it slowly, and you may shortly feel indigestion relief. Licorice (Glycyrrhiza glabra) is an herb that grows throughout Asia, Europe, and the Middle East. It is often used for treating dyspepsia, and related symptoms like nausea and stomach inflammation. A study published in the journal Evidence-Based Complementary and Alternative Medicine in 2012 found that an extract of licorice was effective against functional dyspepsia symptoms, including indigestion, nausea, and stomach pain. Cinnamon (Cinnamomum verum) is a very potent antispasmodic and carminative herb that could help with dyspepsia symptoms, including nausea, cramping, gas, diarrhea, and bloating. It can be used for treating dyspepsia in tea form by adding a half-teaspoon of cinnamon powder to a cup of boiling water. Let it steep for a few minutes, and drink tea while still warm. How can baking soda help for dyspepsia? Since high levels of stomach acid contribute to indigestion, baking soda (sodium bicarbonate) may work similarly to an antacid to relieve the problem. To alleviate dyspepsia, stir a teaspoon of baking soda with a few lemon juice drops in a glass of water. Drinking the water is thought to then neutralize stomach acid and relieve symptoms like bloating and indigestion. Cumin (Cuminum cyminum) seeds have a history of use in Ayurvedic medicine for digestive disturbances, including indigestion, gas, nausea, and diarrhea. They are also responsible for stimulating pancreatic enzyme secretion to help digestion. A study published in the Middle Eastern Journal of Digestive Disorders in 2013 found that cumin essential oil would improve indigestion in 57 IBS patients. To use cumin seeds for dyspepsia, drink a glass of water with a teaspoon of roasted cumin seed powder. Activated charcoal is used to promote a healthy digestive tract by removing toxins from the body that cause oxidative damage, allergic reactions, and poor immune function. As a result, activated charcoal might help alleviate bloating, gas, and an upset stomach. A study from the 1980s published in the American Journal of Gastroenterology found that activated charcoal prevents intestinal gas after a gas-producing meal. Experts recommend you take activated charcoal with a glass of water prior to a meal for alleviating an upset stomach. Follow up with another glass of water to help get the charcoal into your digestive system. Linden is a herb that comes from various Tilia plant species. In European folk medicine, linden has been used to treat a number of health problems for centuries. Flowers from two linden species (Tilia platyphyllos and Tilia cordata) were historically steeped to relieve anxiety related to indigestion and vomiting. Some studies have found that linden flower tea can help treat dyspepsia and excessive gas that causes the stomach to press against the bottom of the heart. For an upset stomach, prepare linden tea by steeping two to three teaspoons of the linden flowers in a cup of hot water for about 15 minutes. Greater celandine (Chelidonium majus) is a perennial plant native to western Asia and Europe that belongs to the poppy family (Papaveraceae). For centuries, greater celandine has been used to treat gastrointestinal problems and dyspepsia. One study found that standardized greater celandine extract could relieve dyspepsia symptoms, including a sensation of fullness, abdominal cramping, and nausea, significantly better than the placebo. Artichoke (Cynara cardunculus) extract is considered a safe and effective treatment for dyspepsia. A study published in the journal Evidence-Based Complementary and Alternative Medicine in 2015 found that a formula with artichoke extract can improve dyspepsia symptoms. Compared to those taking a placebo, the participants that took the artichoke extract formula for four weeks had reduced symptoms of nausea, fullness, bloating, and pain. As a result, the researchers concluded that the artichoke extract supplementation is very effective in the treatment of functional dyspepsia. Coriander (Coriandum sativum) is also called Chinese parsley or cilantro. It is among the top dyspepsia remedies, as it is able to treat symptoms like gas and indigestion. Coriander is thought to work like an antispasmodic drug, which will relax contracted digestive muscles that cause symptoms like indigestion. Research also suggests that coriander can decrease IBS symptoms like indigestion. The BRAT diet is an acronym for banana, rice, applesauce, and toast. These foods are often eaten together to help treat an upset stomach, diarrhea, or nausea. The diet is thought to be bland enough to help with digestive symptoms. However, those with sensitivities to wheat and gluten should still avoid the toast. The diet should also not be consumed long-term, since it contains foods that are low in protein, fiber, and fat, and lacks nutrients overall. Stomach problems like dyspepsia sometimes indicate a gallbladder disease or a peptic ulcer. Long-term vomiting will also put you at risk for dehydration. Visit your doctor if you are having issues keeping water down for more than six hours. Your doctor will also be able to rule out other serious digestive problems such as food allergies, Crohn’s disease, pancreatitis, IBS, and other digestive disorders. Upset stomach, or dyspepsia, can be a very annoying symptom. It is a good idea to consult with your primary health care provider to rule out possible underlying causes of dyspepsia, including GERD, ulcers, H. pylori, IBS, food sensitivities or allergies, gallbladder disease, hiatal hernia, heart disease, esophagitis, stomach cancer, and more. Rather than taking acid-blocking medications with various side effects, there are a number of upset stomach remedies that help treat dyspepsia naturally. Focus on natural home remedies for upset stomach that include certain foods, diets, herbs, and lifestyle choices. The next time you get upset stomach, you might want to try using apple cider vinegar, ginger, peppermint oil, lemon juice in water, probiotics, cumin seeds, fennel seeds, cinnamon, baking soda, activated charcoal, or a heating pad. Kerr, M., et al., “Is It Crohn’s or Just an Upset Stomach,” Healthline, Nov. 9, 2017; https://www.healthline.com/health/crohns-disease/upsetstomach, last accessed Jan. 31, 2018. 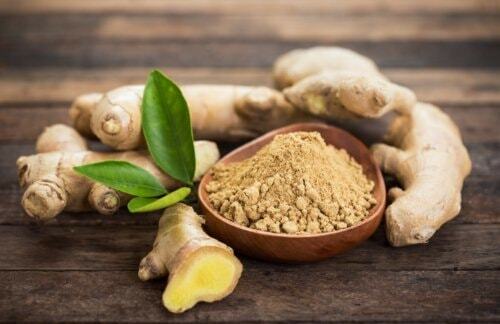 Hu, M-L., et al., “Effect of ginger on gastric motility and symptoms of functional dyspepsia,” World Journal of Gastroenterology, Jan. 2011; 17(1): 105-110, doi: 10.3748/wjg.v17.i1.105. “20 Unique Apple Cider Vinegar Uses + 5 Major Health Benefits,” Dr. Axe; https://draxe.com/apple-cider-vinegar-uses/, last accessed Jan. 31, 2018. “Aloe Vera Benefits: Heal Skin, Constipation & Immune System,” Dr. Axe; https://draxe.com/aloe-vera-benefits/, last accessed Jan. 31, 2018. Keshavarzi, Z., et al., “The effects of aqueous extract of Aloe vera leaves on the gastric acid secretion and brain and intestinal water content following acetic acid-induced gastric ulcer in male rats,” Avicenna Journal of Phytomedicine, March to April 2014; 4(2): 137-143, PMCID: PMC4103709. Ramamurthy Raveendra, K., et al., “An Extract of Glycyrrhiza glabra (GutGard) Alleviates Symptoms of Functional Dyspepsia: A Randomized, Double-Blind, Placebo-Controlled Study,” Evidence-Based Complementary and Alternative Medicine, 2012: 216970, doi: 10.1155/2012/216970. Hoehn, A.N., et al., “The Effects of Cinnamonum Cassia on Blood Glucose Values are Greater than those of Dietary Changes Alone,” Nutrition and Metabolic Insights, Dec. 2012; 5: 77-83, doi: 10.4137/NMI.S10498. Agah, S., et al., “Cumin extract for symptom control in patients with irritable bowel syndrome: a case series,” Middle East Journal of Digestive Diseases, Oct. 2013; 5(4): 217-222, PMCID: PMC3990147. “Top 10 Activated Charcoal Uses & Benefits,” Dr. Axe; https://draxe.com/activated-charcoal-uses/, last accessed Jan. 31, 2018. Jain, N.K., et al., “Efficacy of activated charcoal in reducing intestinal gas: a double-blind clinical trial,” American Journal of Gastroenterology, July 1986; 81(7): 532-535, PMID: 3521259. “Linden,” University of Maryland Medical Center; https://www.umm.edu/health/medical/altmed/herb/linden, last accessed Jan. 31, 2018. “Greater Celandine,” PeaceHealth; https://www.peacehealth.org/medical-topics/id/hn-2101000, last accessed Jan. 31, 2018. Giacosa, A., et al., “The Effect of Ginger (Zingiber officinalis) and Artichoke (Cynara cardunculus) Extract Supplementation on Functional Dyspepsia: A Randomized, Double-Blind, and Placebo-Controlled Clinical Trial,” Evidence-Based Complementary and Alternative Medicine, 2015; 2015: 915087, doi: 10.1155/2015/915087. Nordqvist, C., “What’s to know about indigestion or dyspepsia?” MedicalNewsToday; https://www.medicalnewstoday.com/articles/163484.php, last updated Dec. 7, 2017.